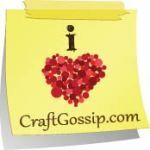 I’ve been looking for inexpensive, quick sewn scrap buster gifts i can make from pinterest. I decided to put my secret Santa persons name on the back using t-shirt transfer paper! And use the ornament as a gift tag too. I totally forgot the fleece interfacing because i was in a rush! Does your Secret Santa person love journalling? This is an awesome tutorial and i have made a few for friends! this is one i made just for me! For journal writing folks like me this is a great gift! Love these and i use mine everyday! My coin purse was a very last minute gift! These are so quick and easy! I hope these ideas give you inspiration for a handmade Christmas!